Time for another foray into Dogwood City Drabble, in which I indulge my obsession with constructing 100-word stories based on Dogwood City characters (and presenting them to the world). 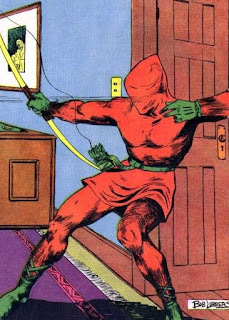 Today's edition features the greatest archer of the Dogwood City universe...the Arrow! First rule of being a vigilante archer: Know your arrows. No one is better at this than the Arrow himself. It’s more than a science. It’s poetry. A web arrow here…a smokescreen arrow there…whatever it takes to get the job done and make a statement. He always has his words at the ready. Right now, though, the Arrow doesn’t need a poem. This isn’t a job demanding subtlety. Reaching back without hesitation, he pushes aside a dozen clever turns of phrase and pulls out three exclamation points. You can never really have too many boxing glove arrows, now can you?